Springtime is coming to the Central Coast and so are the tourists. According to a recent report from Visit SLO CAL, tourists spend more than 1.58 billion in San Luis Obispo County. “Now is the best time to set up your business for a successful 2017 by directing your marketing to tourists,” says Scott Brennan, publisher of the San Luis Obispo County Visitors Guide. 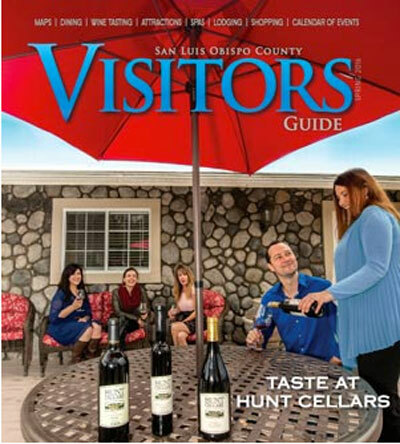 The San Luis Obispo County Visitors Guide is the region’s No. 1 tourist magazine with 120,000 readers around San Luis Obispo County. It’s published four times a year. The next edition is set for mid-February with a deadline of Jan. 31. Call today to advertise – (805) 226-9890. The visitor’s guide features local wine tasting, restaurants, attractions, spas, lodging, shopping, art galleries, museums, golf courses and events throughout its 100+ pages. A favorite feature for tourists is the comprehensive Paso Robles wine tasting map. Distribution of the guide is focused on over 650 hotels, wineries, restaurants, and attractions. “We deliver the guide to the hot spots where tourists will find it. • Click here for an advertising rate card. • Click to see the most recent edition. Tourism continues to keep San Luis Obispo County’s local communities economically vibrant, growing at a 4% rate over 2014, a 14.0% increase from the previous years’ growth rate, according to a report from Visit SLO CAL. Industry earnings generated by travel and tourism spending reached its highest number yet, at $510 million, in 2015, an increase of $40 million from 2014, the report says. Local and State Tax Receipts totaled $132 million in revenue generated by travel spending, reflecting a 6% and 1.5% increase over 2014 respectively. San Luis Obispo County also recorded an 8.6% average increase in Transient Occupancy Tax for 2015, the report says. Over 250 San Luis Obispo County businesses advertise every year, providing valuable information for travelers. The SLO County Visitors Guide covers San Luis Obispo, Avila Beach, Pismo Beach, Shell Beach, Oceano, Arroyo Grande, Nipomo, Los Osos, Morro Bay, Cayucos, Cambria, San Simeon, Santa Margarita, Atascadero, Templeton, Paso Robles and San Miguel.